Summer break is over, school is starting! 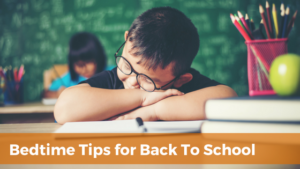 Whether you are celebrating the children going back to school or lamenting the lazy days of summer, it is time to get back into the school routine. Summer usually results in later bedtimes and inconsistent schedules. I fully understand, as a fellow mom, that summer is a time to squeeze in every minute of joy and togetherness – camping, searching the stars, and watching fireworks together. So, no matter what might have happened over the summer vacation, all is forgiven; but it is time to get back on track and start school on a positive note. Getting your child to bed at a reasonable time is the first step to helping him or her start school right. So, what time should your kids be going to bed? Your child needs at least 10 hours of sleep a night. So, I recommend their bedtime be between 7 and 8pm, until your child is about 12 years old. Parents are often surprised by this early bedtime, especially for older children; but getting your child to bed early ensures that they get 10+ hours of sleep. Ten hours is the minimum, an extra hour or two on top of that is never a bad thing. Your child needs to be awake by 7am in order to get ready for school. They should be asleep by 9pm at the latest to get their ten hours in. But, in reality, it takes time for your child to fall asleep, request that last glass of water, or insist on using the bathroom one more time. So, 8pm should be the latest bedtime to ensure that they actually get those ten precious hours. Besides the precious sleep that your child is getting when you put them to bed early, you are able to have child-free time. You are able to watch a non-kid TV show, eat chocolate without sneaking it, and just enjoy some quiet time. You and your partner, if there is one in the picture, are able to connect and recharge. Now that we know when to put our child down, how do we do it? How do we transition from summer to “back-to-school” mode? Don’t leave it to the last minute. Hopefully, you are reading this with a bit of time before school starts because the easiest way to get back on track is little by little. Try moving up the bedtime by 15 minutes every 2-4 days, until you are back to their normal bedtime. Re-establish your bedtime routine. The familiarity of your previous routine will help your child settle back into the schedule easier. If you don’t have a bedtime routine, create one. Repetitive, predictable bedtime routines will ease the stress around bedtime. It will change your life. 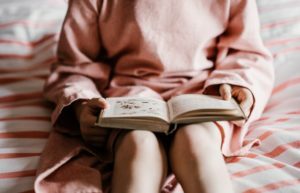 The routine associated with bedtime activities such as a bath, reading stories, and brushing teeth promotes the production of melatonin, a hormone that signals that it is time to wind down and go to bed. Use a timer. This will help keep things on schedule and helps avoid the “just one more story, Mom/Dad”. Also, the timer isn’t as flexible as mom or dad. It has a definite end point. Turn off screens. Screens, whether phones, TVs, computers, or tablets, emit massive amounts of blue light, which our brain associates with sunshine. So, screens before bed can actually have the unwanted effect of firing your kid’s system back up when it should be powering down. Try to avoid any screen time for at least two hours before bed. Make it dark. Even though the summer is winding down, the sun can still be shining past your child’s bedtime. As described above with blue light, sunlight stimulates your child instead of telling them to wind down. I suggest investing in blackout blinds or blackout curtains. On a budget? Amazon sells non-adhesive window film that blocks out the sunlight. 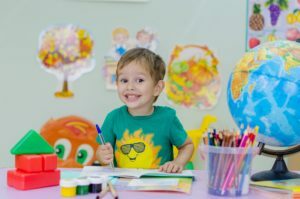 Your child may have enjoyed the leniency of their summer bedtimes and may argue, plead and cajole you to keep up this leniency. Expect to hear constant opinions for why they should be allowed to stay up later. I think that lawyers should take a playbook from children, they are persistent and can come up with a multitude of excuses to win an argument. Remember, you are the parent! And let’s face it, parenting is not a democracy. You are the queen or king of the house and get to make the rules. Stand firm in your rules, routines, and schedules. 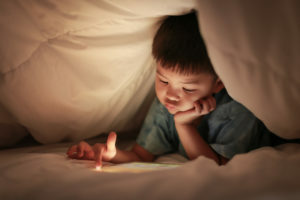 That 8pm bedtime is going to be set in stone for several years and once your child realizes that it is the norm, bedtime will be easier and easier. I hope you and your child are looking forward to starting the school year and that the transition will be smooth. No matter the grade or preschool level, a good night’s sleep will give them the energy and positivity to be happier, more socially outgoing and ready to learn. If you have any questions or want help developing an effective sleep routine for your child, please schedule a chat with the link below. 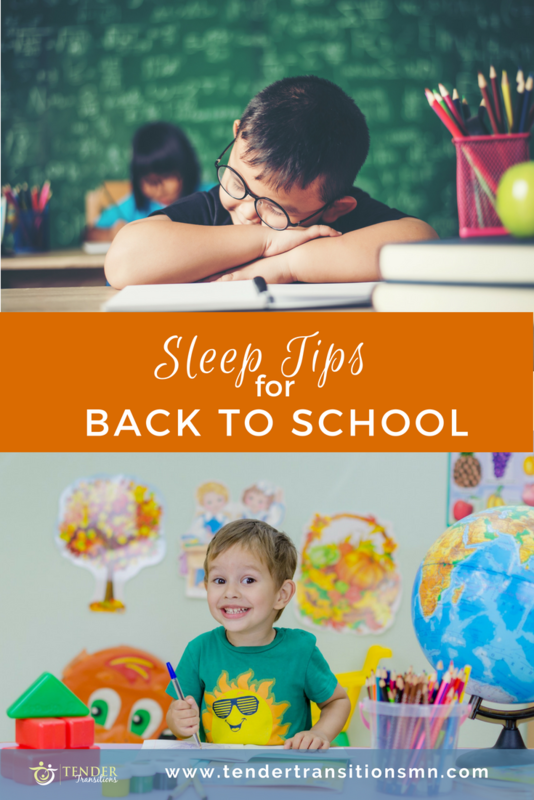 In case, you would like to read more on the benefits of sleep for children in relation to school, I have included a couple of journal articles below.